CarProperty.com for the real estate needs of car collectors / What is a Car Property? A Car Property is real estate or businesses with a strong automotive use component. They can be for sale or for lease/rent. Car properties are a niche market, but it is a very large niche market. It is our mission to help you and everyone else for that matter, discover car properties of all types and in all locations. CarProperty.com is an advertising website for people and business who love garages and who use their garages whether for pleasure or professionally. We provide an advertising platform where end users can register for accounts and place ads on individual car properties in the appropriate category. They can also place banner style ads to promote individual properties or their business through those site wide banner ads. Visitors to the site can browse the different ads on the site and they can also use our search functions, all without registering an account on the site. Some of the sites features will require you to register on the site to use them. Post a category ad listing on www.CarProperty.com by clicking on the Advertise tab in the upper left hand corner, it’s easy and fun. You can also buy large Banner ADs on CarProperty.com that provide a high level of branding, ad response and increased sales. 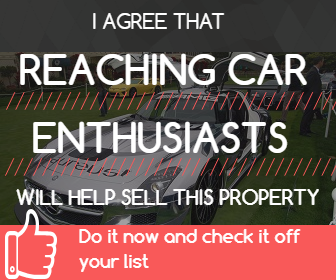 Car Collector House (Residential): A house that a car collector or car enthusiast would love to own or rent is a Residential Car Property. It's not always how big the garage is that matters because there are all different types of car collectors and car enthusiasts. - House with a Mega Garage (4-car garage or more). This is the kind of Car Property that people think of when they hear the phrase, Car Property and they truly are Car Properties, but as you can see from the definitions described below, there are many different types of residential Car Properties! - Houses with a garage space that has been remodeled (no matter how big the garage is) and turned into a show place, awesome workshop, entertainment center or any combination of unique remodeling ideas. The phenomenon of garage remodeling also qualifies as a residential Car Property. - Houses located in high density suburban areas that have just a 3-car garage, (instead of a 1-car or 2-car garage) provide extra space that would make that house a Car Property in those high density neighborhoods that tend to be in high population regional metros. - RV Parking. Due to overwhelming client requests we have added this focus to our repertoire of real estate types that we consider to be a car property and this includes residential and commercial lots. - Houses with garages in major urban cities. This can be anywhere from a house with a 2 car garage and up and sometimes even a 1 car garage in one of these cities would be unusual for the neighborhood and are considered a car property. In many urban cities parking is so scarce that the property owner can rent out their garage space. - Houses where the garage is deeded separately and can be transferred to buyers separately from the house. If a lot has a building on it that is or can be used for an automotive use, than it is a Commercial Car Property. This can be a Commercial Car Property that is for lease or for sale. Car collectors use commercial buildings that allow an automotive use for their car hobby or profession, such as a warehouse, airplane hanger, etc., when they can find them. Businesses also need to be able to locate Commercial Car Properties for many different business reasons. The problem is that most of the time the owner of this kind of Car Property or their property managers do not advertise or promote the fact that the building or site allows an automotive use. One of the reasons for not promoting this automotive use is that until CarProperty.com came along, they have not had an effective resource that reached the entire world; had a dynamic and growing user base and was very cost effective. There is no reason to keep these properties a secret any longer. Car dealership; Gas station; Auto repair shop; Racing team; Parking lot business or other such company or business that provides an automotive service or product for its' customers. Business that are linked to the use of automobiles, trucks, boats, RV's, motorcycles and services that rely on those things are also Car Property Business Opportunities. On track real estate; Race track time shares; Garage spaces for rent; High and low tech automotive storage facilities; Car condo's, Trackside condo's for viewing races; Office space for your business; Manufacturing space; Vendor space at events; Sponsorship opportunities on different pieces of the track buildings or viewing areas; RV parking reservations; Parking lot ticket offers. The list continues to grow all of the time. This is a really exciting category and type of car property because many times these facilties offer some great interactive facilities and experiences at their car properties. For people who run and manage racing facilities and tracks, you should use CarProperty.com to advertise and promote the things listed above and a wide variety of other things, like events and more. Most fans of Car Properties are also racing fans! This category consists of Car Condo's that tend to be membership based luxury facilities or non membership based high end and comfortable facilities where people can purchase space for their cars, planes, boats and other vehicles. Plus, some of these facilities are for rent. People can usually have their entire unit remodeled to suit their tastes. The membership facilities also offer events for their members and for the genreal public and much much more. These are facilities that offer a wide variety of amenities and different types of spaces. This category also includes any storage facility that allows vehciles to be parked or garaged indoors or outdoors. These parking facilities are for cars, boats, RV's, trucks, collector cars, airplanes and any other vehicle that rolls, floats or flys. Daily, overnight and monthly parking; Airport parking, City parking lots and garages and more.